As an artist, when you notice that little spark of an idea, that trigger that calls your attention, no matter how briefly, give it your attention; make an effort to follow that story, that path, that rhythm, that idea, and see where it takes you; that journey is what art is. Don’t “do nothing”. The idea of a photo like this has been bouncing around in my head for years now; Mt. St. Elias, after dark, with a night sky packed full of stars, and the faintest of glows from our favored star, the sun, lighting the mountain. Yet there were so many reasons why I never took this photo; Mt. 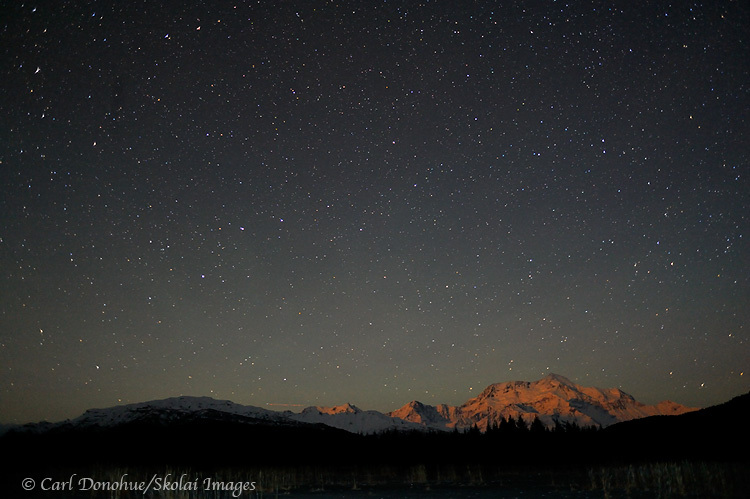 St. Elias is hard to get to, and costly, and when you do visit, the summer sky doesn’t get dark enough anyway. Further, in summertime, the alpenglow is on the far side of the mountain, which would mean either shooting the shaded and unlit mountainside, or camping on a glacier (even harder and costlier to get to) on the mountain’s northern side. So, for these and so many other reasons, this photo remained nothing more than a fantasy. I thought ‘oh yeah, that’d be neat’, but never followed up. Finally, last month, I set off on an adventure that included a very singular focus; I wanted to shoot a photo of Mt. 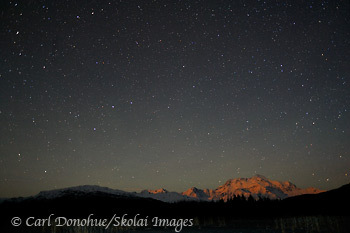 St. Elias, aglow under a night sky. Beautifully written Carl. And a BEAUTIFUL photo! The larger version is sweet Carl – the thumbnail just doesn’t do it justice. Single exposure, or did you wait for the night sky and do a blend? Hey Tracey; thanks so much. Hey Ron – Thanks. It’s a single exposure, well after nightfall – it was actually shot right around midnight. I used my headlamp to light the foreground a tad .. I wanted just the hint of a glow on the foreground, rather than the standard over-the-top light painting we see so often. I felt that softer glow made a little more of an eerie mood to it. Love the eagle shot in the corner! Amazing shot in such low light. You da man. A spectacular image Carl. I appreciate the insight into all of the factors that need to come together to realize it. That can be a difficult thing with the image alone if you are not familiar with the area and conditions. This would look so awesome as a large print. Is that an airplane on the horizon?? I wouldnt think there’d be many fly overs there. This is lovely… the post and the picture. Thanks so much for the kind words, I’m glad you enjoyed the picture and blog. @Greg; the eagle shot you mentioned is part of a rotating slideshow that appears up the top; so as I read your comment, I was like “whuh?”. But thanks, yeah, that’s a favorite of mine, too. @Stan – yes, I believe it’s a plane flew by. they don’t fly over too much, but they do go by here now.